The marking that is applied to a UN package indicates the type of package and the levels to which the packaging has been approved. The following describes the sequence of numbers and letters that appear in a UN marking and what they designate. Example of UN Marking for Solid Hazardous Materials in single or composite packaging or combination packaging for all materials. 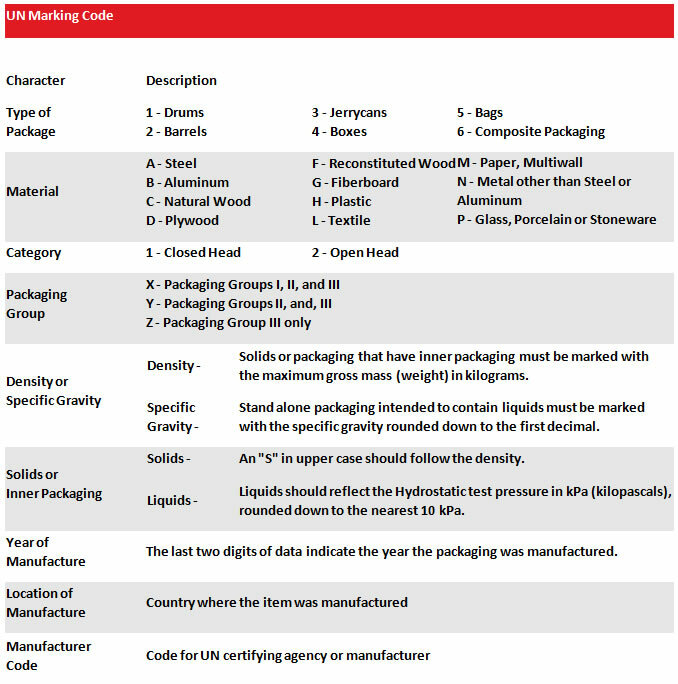 Example of UN Marking for Liquid Hazardous Materials in single or composite packaging. First let’s look at a hypothetical example of UN Marking for Solid Hazardous Materials in single or composite packaging for all materials. The first digit references the type of solid hazardous materials package, in this case, a drum. The second indicated the drum material—fiberboard. The third indicates the category within the packaging type, Open Head or Closed Head, in this case open. The drum falls in to Packaging Group Y (Group II or III) with a maximum mass gross weight of 120kg. Bulk density is used with solid applications. Next, the marking indicates a solid single application, followed by the year of manufacture, 2015, the country of origin, USA, and the manufacturer code. In short, we have a fiber drum, solid rated with a max density of 120kg, made by the listed American manufacturer in 2015. Next, we’ll look at an example of a UN Marking for Liquid Hazardous Materials. The first digit references the type of liquid hazardous materials package, again in this case, a drum. The second indicates the drum material—plastic. The third indicates an “open head” package. The drum again falls in to Packaging Group Y (Group II or III) with a product specific gravity rating of 1.8. The drum is rated at 30kPa, or Kilopascals, a value used to measure static pressure. Next, the marking indicates the year of manufacture, 2015, the country of origin, USA, and finally the manufacturer code. In summary, we have a liquid plastic open head drum, with a specific gravity rating of 1.8 and 30kPA, made by the listed American manufacturer in 2015. For more information on which product is right for you, please consult with your regulatory specialist, consult the links on our webpage or contact one of our Packaging Specialists. Illing Company is dedicated to Packaging Your Vision.